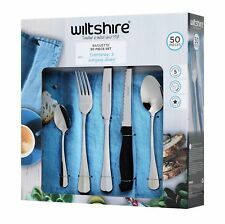 This Wiltshire cutlery set is a simple, classic design - there’s no need to over complicate such things. Avoid abrasive cleaners and scouring pads as they will scratch the cutlery surface. Made From: Stainless Steel. It originated in the town of Laguiole in Southern France. The Laguiole design is defined by the shape of the cutlery and the iconic Bee emblem. Laguiole French Cutlery Set 24 piece 6 Steak Knife Stainless Steel Dinner Set. Wow your guests with the introduction of gorgeous cutlery into your dinnerware collection. PVD gold mirror head plus black painting. Sophisticated black and gold accents scream luxury on your dinner table. Pakage Included: 24 x Stainless Steel Cutlery Set with Wooden Gift Box( 6 sets ). 6 x Dinner spoon: 20.2cm 13cm 4. cm 61g/pc. 6 x Tea spoon: 14.5cm 9cm 3.3cm 23g/pc. • Manufactured from High-Grade Stainless Steel, Chateau Laguiole Cutlery is long lasting and versatile • The recognisable and sought-after design is perfect for both special occasions and daily use. Chateau Laguiole is the only SGS approved Laguiole available • The 24-Piece Cutlery Set consists of 6 x Table Spoons, 6 x Table Forks, 6 x Teaspoons and 6 x Knives. Manufactured from 430 stainless steel, the table knives, forks and tablespoons are 1.8mm thick and the teaspoons are 1.5mm thick • The ABS handles are food-safe and functionally ergonomic. Excellent Condition Robert Welch Finest Stainless Steel Bourton 56 Piece Cutlery Set. Knife blades are made from special hardened stainless steel to provide the finest possible cutting edge. Soup Spoon (8). A. 24pcs tableware sets for 6 person. Pakage Included: 24 x Smooth Stainless Steel Cutlery sets with Wooden Gift Box( 6 sets ). 6 x Dinner spoon: 20.2cm 13cm 4. cm 61g/pc. A. 24pcs tableware sets for 6 person. 6 x Dinner spoon: 20.2cm 13cm 4. cm 61g/pc. 6 x Tea spoon: 14.5cm 9cm 3.3cm 23g/pc. Spoon: 18.8 3.8cm. Fork: 19 2.4cm. Material: Stainless steel. Normally your parcel will arrive smoothly. Color：As the picture. 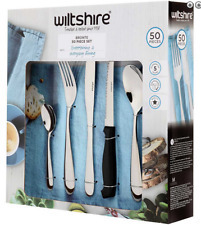 BULK BUY 48 PIECE CUTLERY SET. Coffee & Tea. 12 Tea Spoons - 13.5cm long. 48 Piece cutterly set. 12 Table Forks - 19cm long. We require pictures to be sent to us. 12 Table Knives - 21.5cm long. 12 Table Spoons - 20cm long. BABENY Kids 4pcs Cutlery Set. The sooner you start the faster the kids will get used to using cutlery on a daily basis. Made of 100% stainless steel with color plastic handle with ergonomically designed to fit perfectly in small hands, making eating fun! Trending at AU $102.69eBay determines this price through a machine-learned model of the product's sale prices within the last 90 days. It’s this kind of custom detail, along with the genuine Danish design, which makes the Scanpan Spectrum Cutlery Set stand out against other cutlery sets on the market. Bring a touch of colour to your cooking, with Scanpan’s new Spectrum collection. A little kid always feels pretty special when they get that first (semi) grown-up set of cutlery. If there happens to be puppies on the utensils, well, all the better. It'll create a mood that's sunny! Trending at AU $49.71eBay determines this price through a machine-learned model of the product's sale prices within the last 90 days. PICK UP OPTION. Buy now and save! You might also like. Entertain as often as you fancy, and to great effect, with coordinating cutlery. Shop brands such as IKEA, Wiltshire, Tablekraft and Stanley Rogers for stainless steel cutlery sets in classic and contemporary styles to find the design that best reflects you. Enjoy the experience of owning stainless steel cutlery that lasts beautifully for many years as it resists corrosion, staining and rusting with zeal. It is also stronger and more durable than ordinary steel, making it a cost-effective option for catering businesses and restaurants with their eyes on the bottom line. Since stainless steel is also not damaged by heat, it retains its shape and form through hot meals and the high water temperatures of dishwashers. 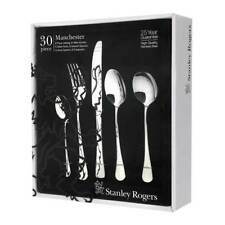 Cutlery sets create a coordinated look that easily incorporates into any existing decor or setting. Matching sets accommodate your service needs in a most aesthetically-pleasing manner, be they a grand 56-piece set for an eight-person dinner party at your restaurant, or a 20-piece set serving four at your cosy couples dinner. Look for stainless steel flatware with an ergonomic build as it fits easily into the palm of your hand. Steak knives and forks that are crafted from forged stainless steel have more heft in the hand than those that are made from stamped stainless steel. Thus, they are more comfortable for use than those that feel lighter in the hand. With proper care, stainless steel cutlery may last you a lifetime. Although it requires minimal care and is dishwasher safe, ensure that you do not mix stainless steel flatware with other metals in the dishwasher. Dry it immediately after washing and buff it with a soft, dry cloth to remove any watermarks. Maintain the glossy finish by using a stainless steel cleaner regularly.